As of late last week in an Ebisu straw poll, Kerry/Edwards are ahead with 27 resident votes; Bush/Cheney trail far behind, with only 3, just slightly ahead of Ralph Nader, who's earned but 2 votes so far. IceRink Zamboni is a slender, tan brunette, and when I interview her, she's wearing a form-fitting, pro-Kerry body stocking. In real life, as she tells it, she's a music educaton/perfomance major (with an emphasis on opera) at a West Coast college. "I am a member of my university’s Democrats group," she says. "I subscribe to moveon.org and other newsletters, and hold viewing parties at my house for events like [the] Democratic National Convention!" During the primaries, she actually followed the Howard Dean campaign more closely-- she even keeps Dean's infamous "YEEEEARGH!" scream as a sound clip in her inventory, and plays it for me, when I mention it-- but since then, she's fully turned her attention to the Kerry campaign. "He's a great leader and exemplifies many qualities I wish would return to the White House," Zamboni tells me. "I also trust him to lead our country in the right direction.... Kerry can provide the fairness and sound judgment missing in the current Administration." 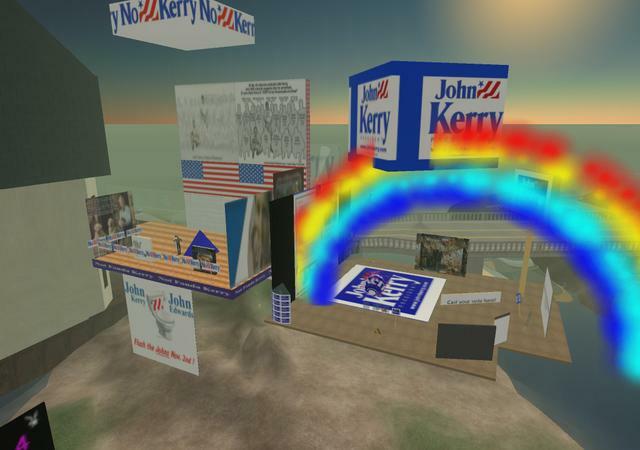 So her Kerry site in Second Life is an extension of her offline activism-- she's even contacted John Kerry's official website, to tell them about this virtual campaign headquarters she's erected for them. "I did it recently," she says, "but haven’t really heard much back yet. So I will try again in a few days!" Meantime, she's planning to host more pro-Kerry events at her site, to take advantage of its popularity thus far, and to attract even more visitors. "I haven't a lot of cash so I can't post a contest or anything, so I am in the process of brainstorming," says Ms. Zamboni. "As for now, I get about forty visitors every few days. I think that is pretty good!" 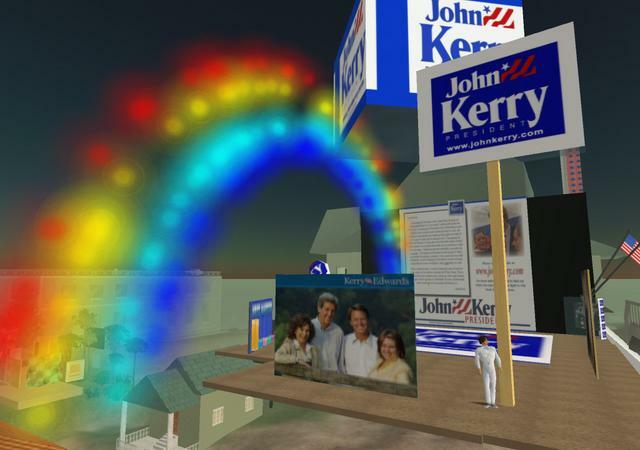 And if representatives from the Kerry-Edwards campaign ever do take the time to log into Second Life and visit Ebisu, they'll no doubt be impressed by her enthusiasm on their behalf. That is, if they can get past the giant billboard on the other side of the highway-- featuring their candidate and Jane Fonda and a title that loudly announces "Not Fonda Kerry". Or the giant spinning cube hovering above her site, announcing "No Kerry" on every side. Or the slightly smaller cube above it, which depicts a cartoon cowboy George W. Bush, branding a donkey. Or most of all, the floating platform that now stands right beside Kerry headquarters-- proudly labeled, appropriately enough, "Kerry Bashing Headquaters", where you can find a poster of Kerry, for example, with a gory hand on the Vietnam memorial, and a heading that reads (as if these words were spoken by the deceased veterans of that war), "Our blood is on YOUR hands", or a lengthy message denouncing Kerry's performance as a Navy officer, when he commanded a swift boat patrol on the Mekong Delta. "Did you see the sign below?" asks Dugo Jacobs, referring to his anti-Kerry handiwork beneath us. That's the one enjoining residents to "Flush the Johns Nov. 2!" Dugo's a solidly-built blonde man with a thick mustache, mirror sunglasses, and a black leather motorcycle jacket. "And I have the billboard across the road and signs across the river." "Funny," I observe, "you don't look like a traditional Republican." "I'm not," he answers quickly. Rather, Jacobs describes himself as an independent. 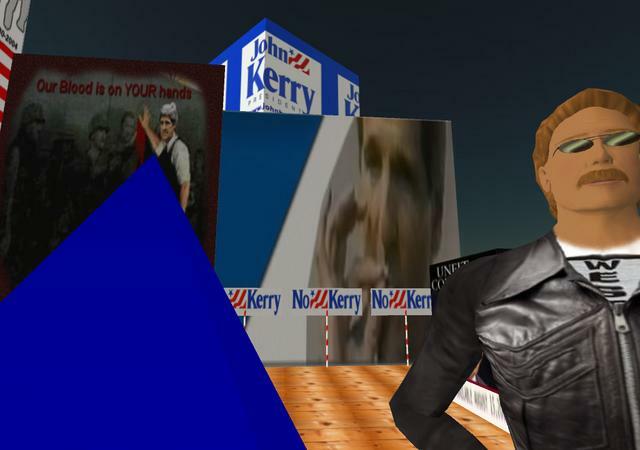 "I'm definitely not fond of Kerry," he adds, "but I think the political stuff should be left out of Second Life, so I put this up to send a message... I just want people to see the other side of things, not to be one-sided." To achieve this, he recently bought up most of the property around Ms. Zamboni's site (he already owned a plot where the Jane Fonda billboard now stands), and proceeded to ring her project with anti-Kerry rhetoric. "I have more articles I want to add tomorrow," Dugo Jacobs vows. "His record on voting issues, [the] military, etc..." Jacobs declines to speak on record about his real world political beliefs ("Don't like to tell personal things"), but distances himself from outright Bush advocacy. "The only pro-Bush thing [in Ebisu] is the sign across the way," he says, referring to the cartoon cowboy, "I didn't put that up." 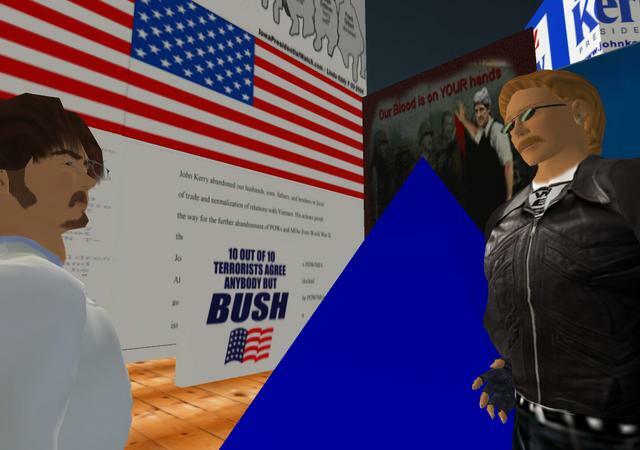 He prefers instead to discuss how inappropriate he thinks it is, to bring offline politics into Second Life. “The worst part of it is that there are a lot of people here [who] aren’t from the USA,” Jacobs grouses. “If I wasn’t, I wouldn’t want to look at it.” So his strategy-- as far as I can understand it-- is to clutter Ebisu with even more political speech, until his new neighbor Zamboni surrenders, and dismantles her Kerry site. 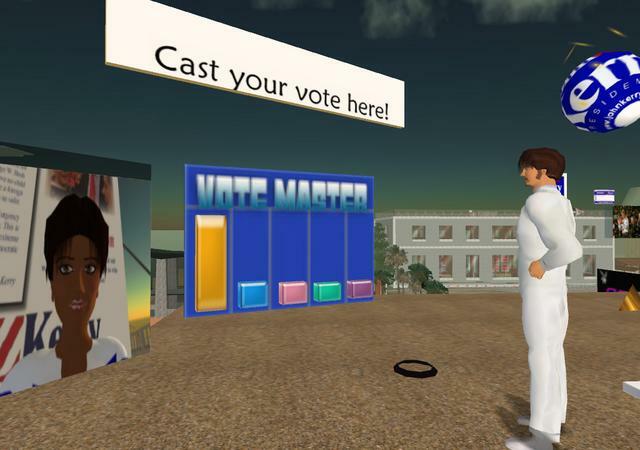 “I’ve been sent many Instant Messages,” says Jacobs, “saying they like [my own] plot.” In Second Life, it’s possible to “rate” another resident’s creative projects. In contrast to the pro-Kerry skew at IceRink Zamboni’s site, Jacobs claims full support for his contrary effort, by those who cared to rate it: he’s garnered over twenty positive ratings, and zero negative. To get a sense of what their neighbors really thought about this tribute (if that’s the right word) to the upcoming election, I flew around the block, and began knocking on virtual doors. And while I didn’t hear back from the nearby Canadian resident with telltale red maple leaves all over his estate, who has no choice but to look out on this supersized microcosm of the American democratic experiment every time he’s on his balcony, other neighbors I spoke to had a wide range of opinions. Closer to the sites, in a glassy home with a Spanish, red-tiled roof, JeanPaul Galatea sees things a bit differently. “[L]iving next to them is a pester and an annoyance,” Brad Casanova seethes. Brad lives with several roommates in a large home beside a pond, where he has a worm’s eye view of both sites. “Constantly hearing ‘playground’ disputes over who's better suited for the president was cute the first day, but after a few, it's not.” He has no strong opinions on the election, himself. Wrapping up my interview with IceRink Zamboni, I ask her if she plans to address the criticisms that Dugo Jacobs is making of Kerry on the platform a few feet from her, especially those about his conduct in Vietnam. “Not true,” Dugo Jacobs interrupts. Jacobs is floating some twenty feet above us; LordJason Kiesler is beside him. “There's video proof of them saying they don't support him," he continues. The two are unable to come any closer, because Ms. Zamboni has banned them from her property and her airspace. If they try to get any nearer, red force field beams will just bounce them back. “No,” says Kiesler, “you’re trying to do something that’s upsetting the experience in this game." Thanks for the article, Hamlet. The place is okay, but it will be nice without the spinning signs. Correct, the voting machine was reset after a short time. The Pro Kerry place is now hovering in the sky and can be reaced by a two way teleporter. Oh, and that is not a roulette wheel. It is a skydiving elevator car. I saw this, I am a Bush supporter my self, but I can not say much about this, with what is going on with Bush in Jessie. But I just feel that stuff like this should not be thrown in my face. Jessie, I would give more tolerance for, because it is a dangerous area, "no mans land", where anything goes, it's not like this in the normal sims. Bush should not be re-elected. He is a liar and if we keep him in the white house, America will just fall down hill from there. Vote Kerry-Edwards!!!!!! im a bush supporter although i dont agree with some things he says but guess wut, I LIKE MY GUNS SO F U KERRY anyway if u need guns or armour or any kind of truck heli copter plane or sumtin else u can contact gorm gomez and he will give u my sl name cuase i dont want million ppl knowing about it. also i give kill tours in my armoured heli in jeese so if u ever want go on one its 75l for 10min 140 for 30min and 200for hour anything else well neggotiate any way thats my post. Did you see the horrible news about today's Miami shootings with the masked gunman?